Russia on Wednesday sought to publicly contest U.S. claims that it is violating a key arms agreement by exhibiting a missile at the center of the dispute. For years, the United States has accused Russia of covertly developing a cruise missile that violates the Intermediate-range Nuclear Forces (INF) treaty, a landmark Cold War agreement signed by the U.S. and the Soviet Union in 1987. In November, the Trump administration cited the missile when it announced it was pulling out of the INF treaty, setting off alarming warnings that the White House was dismantling a core pillar of international arms control and risking a new arms race. Previously, neither side had provided many details about the missile at the center of the dispute, which the U.S. first began objecting to under the Obama administration. But on Wednesday, Russia, which denies the American allegations, undertook a performance to try to bolster its argument that the missile complies with the treaty. 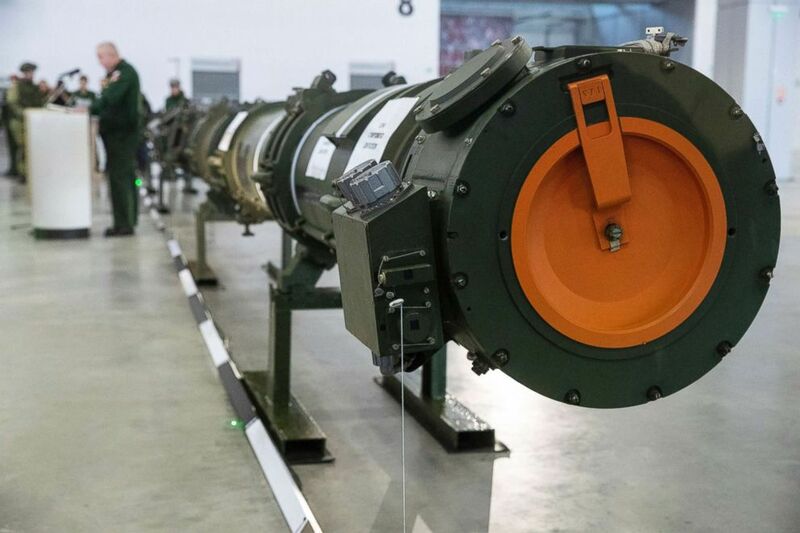 Russia's defense ministry invited dozens of journalists, as well as foreign defense attaches, to a military theme-park outside Moscow to attend a presentation of the missile, which is named 2M729. (Pavel Golovkin/AP) The 9M729 land-based cruise missile in Kubinka outside Moscow, Jan. 23, 2019. American officials only identified the missle publicly as 2M729 in December 2017. The American side argues that the missile's range violates the INF treaty's ban on Russia and the U.S. deploying ground-launched missiles with ranges between 500 and 5,500 kilometers. Russia denies that and has accused the U.S. of using the allegations as a pretext for pulling out of the INF treaty. The dispute has now reached its climax after U.S. Secretary of State Mike Pompeo issued an ultimatum in December for Russia to return to compliance within 60 days or else the U.S. will trigger a withdrawal mechanism from the treaty. Russia said Wednesday's demonstration was intended to prove that the U.S. claims against it were unfounded, saying it had decided to exhibit the missile publicly because the U.S. had turned down offers to inspect it. The presentation, though, was unlikely to do much to settle the argument. Instead, experts said, it showed both sides had now ceased trying to save the treaty. “I think what we see now is Russia and probably the United States are both now into the 'who’s to blame for the end of the treaty' as opposed to trying to find a serious solution,” said Steven Pifer, an ex-U.S. ambassador to Ukraine and former senior director in the National Security Council, who has taken part in arms control negotiations with Russia. At the park, journalists were first given a briefing before being taken to a huge hangar where two missile containers labeled with the names of two types of missile lay horizontally on the ground. A mobile-launcher was off to the side. A general, standing at a podium, then ordered two soldiers in full battle gear and armed with laser pointers to indicate the different sections of the missiles on the containers. The containers were never opened to show the missiles inside and the weapons were never actually demonstrated. “Do we even know if there are missiles in those canisters?” said Pifer, who is now a non-resident fellow at the Brookings Institution. 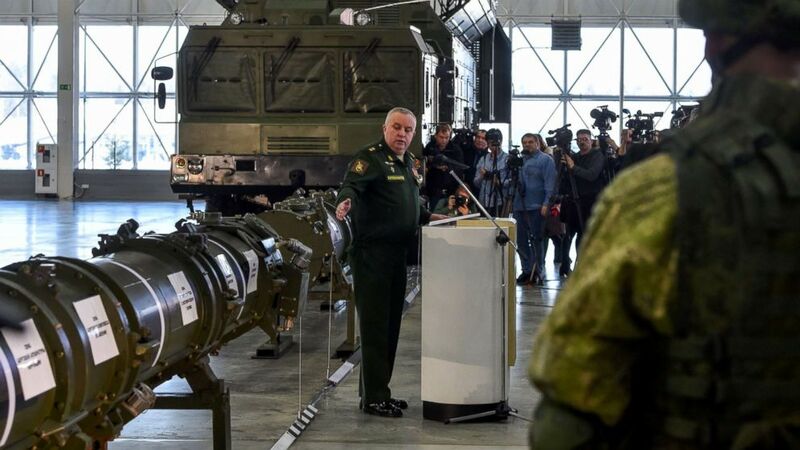 (AFP/Getty Images) Russian Defence Ministry officials show off the new Russia's 9M729 missile at the military Patriot park outside Moscow, Jan. 23, 2019. In January 2018, Pifer in an op-ed for The Moscow Times, called on Russia to prove the missile wasn’t in violation by exhibiting it. Wednesday’s presentation, he said, was far from what he had in mind. “A real technical demonstration, to my mind, would have involved probably opening up the canister, even opening the missile — here’s the size of the fuel tanks, here’s the engine,” said Pifer. The Russian case is the 9M729 is simply a modernized version of an older missile that complies with the INF treaty, the 9M728. The head of Russia’s rocket and artillery forces, Lieutenant General Mikhail Matveyevsky said on Wednesday that when the new missile was upgraded for greater power and accuracy, it also became heavier. As a result, Matveyevsky said, the missile actually had a range that was 10 kilometers shorter than its predecessor, coming in at 480 kilometers. The two missile containers in the hangar were meant to demonstrate the differences between the two missiles — the 9M729 is longer for instance. The Russians also claimed the two missiles had the same size fuel tanks and engines, though they did not show them. Most outside experts are skeptical of the Russian claims, though there are few details in the public domain about the missile. U.S. security officials have insisted they have intelligence proving the 9M729 can fly well over 500 kilometers. On Wednesday, no European Union or American military attaches attended the presentation, signaling their countries’ unwillingness to lend the Russian demonstration credibility. The question of whether the missile actually complies with the INF treaty may ultimately be moot. Many observers believe the Trump administration’s decision to exit the treaty is motivated less because of Russia’s violation than over concerns about countering China, which is not bound by the agreement. National Security Advisor, John Bolton, while visiting Moscow in November to inform Russia of the U.S. intention to pull out, told the Russian newspaper Kommersant that there was “zero probability” the INF treaty could be saved because it would require not just Russia but also China to dismantle its medium-range missiles, even though it is not party to the treaty. 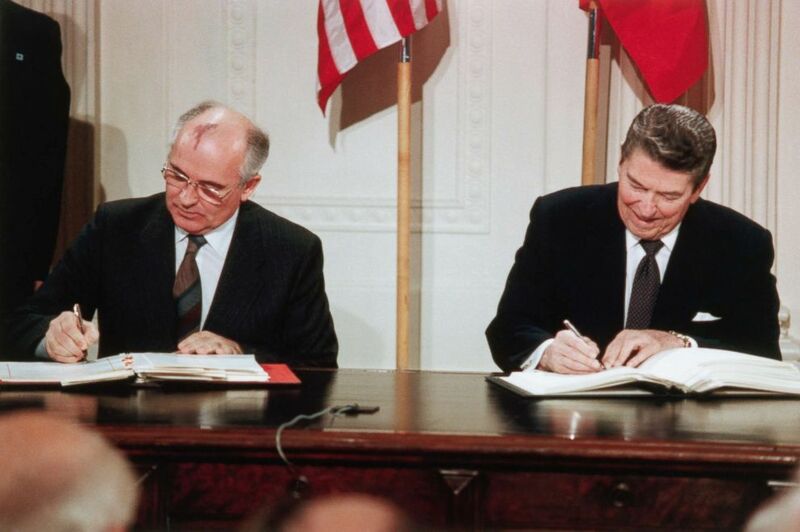 (Corbis via Getty Images, FILE) Mikhail Gorbachev and President Ronald Reagan sign the Intermediate-range Nuclear Forces (INF) agreement in the East Room of the White House, Dec. 8, 1987. The Russians have their own list of alleged violations for the U.S., which are particularly focused on missile defense systems in Europe. It believes they can be easily converted into firing cruise missiles. The two sides met in Geneva on January 15 to discuss ways out of the impasse but both left saying zero progress had been made. Ryabkov on Wednesday described them as a “total failure." Most experts now expect the U.S. to begin leaving the treaty when the 60-day ultimatum period expires. Although Russia continues to express that it wants to preserve the treaty, many experts believe Moscow also finds it outmoded. “To some extents the treaty has outlived its initial purpose,” said Malcolm Chalmers, deputy director general of the Royal United Services Institute. Both countries, particularly in their militaries, now feel the Cold War-era treaty ties their hands, while other countries, such as China, are free to develop the same weapons. The collapse of the INF treaty and the loggerheads over the missile verification were also a symptom of the broader breakdown in Russia-U.S. relations, experts said. “Trust and verify” are at the core of all arms control agreements, said Darya Dolzikova, a specialist on non-proliferation and nuclear policy at RUSI. She was referring to a phrase beloved by President Ronald Reagan, who signed the INF treaty with Soviet leader Mikhail Gorbachev in 1987. “But if there’s no trust, at the end of the day," she said, "no amount of verification is going to be helpful."